Full disclosure: I’m nuts over “Third World” MiG’s. And if you share that passion, you’ll lick your eyebrows at this terrific tome! 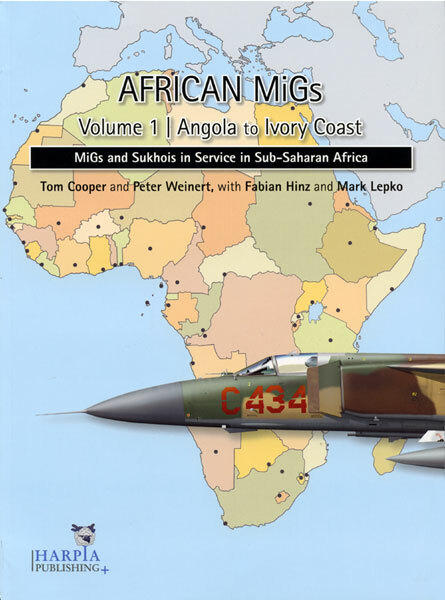 African MiGs (Volume 1) - Angola to Ivory Coast - MiGs and Sukhois in Service in Sub-Saharan Africa expands Harpia Publishing’s earlier landmark title to a new, fully revised, two-part effort. No other work approaches its value, scope or authority. Authors Tom Cooper and Peter Weinert – with Fabian Hinz and Mark Lepko – have clearly penned the definitive history of these ubiquitous warplanes in African military service. And don’t let the title fool you. In addition to MiG and Sukhoi designs, coverage also embraces Chinese Chengdu and Shenyang fighters in twelve countries from Angola to Ivory Coast. Over 120 rare B&W and color photos, three appendices, and twelve maps supplement the splendidly researched text. Modelers and markings enthusiasts will particularly prize dozens of brilliantly executed color profiles by coauthor Cooper. Stunning! And it doesn’t demand sequential reading. I happily and hungrily roamed from Angola to Ethiopia to Guinea to Burkina Faso – then filled-in the rest. This encyclopedic account utterly encourages sampling and savoring! Reflecting exclusive information, African MiGs (Volume 1) deserves a spot in every enthusiast’s library. Buy, beg or borrow this wonderful work. Then line-up behind me for Volume 2!